The key here is to always make sure that what ever adhesive you are using you need to make sure it is Acid Free. (This includes you glitter glue!!) No point in working so hard creating a beautiful album of fabulous pages for your family to have forever just to run those pages over time with the wrong adhesive. Here are 10 different types of adhesives. If you have not herd of some please ask and I would be happy to share. There are probably more out there too so let's enlighten each other on the wonderful world of things that stick. Dimensional - usually a foam center between two pieces of adhesive; gives dimension to your page, be it photos or embellishments. Dots (also called tabs) - small pieces of adhesive, usually found in a roll or on cards, that are perfect for attaching small embellishments like buttons, chipboard letters, or acrylic items. 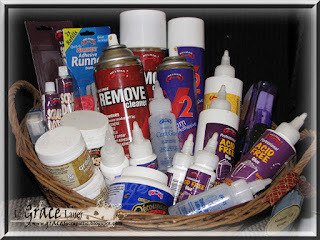 Liquid - often quick drying with an even consistency, good as a multi-purpose adhesive for scrapbooking. Multi-purpose - handles multiple types of media used in scrapbooking (paper, fabric, chipboard, embellishments); a good choice for a beginner. Permanent - when you want your photos and embellishments to stick forever, permanent is the way to go. Comes in a variety of formats (including dots, liquids, glue sticks, and sheets), and cannot be moved. Ever. Re-positionable - allows you to move pieces of your layout for a short amount of time before they become affixed to the page. This also comes in a variety of forms. Runners (also called tape runners) - easy application, allows for control over the amount used. These also work on a variety of media types. Sheets - used to create stickers, often used with a machine. 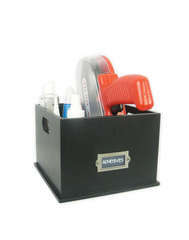 When used with a machine, great for die-cuts and paper letters. Spray - use for "invisible" hold, for items like vellum or transparencies. Stick - easy application, works well with a variety of surfaces and media. A very good choice for a beginning scrapbooker. Storage Solutions: Basket or drawer on or in your desk, hanging them up on the wall in front of you, photo box etc. The key with storing these is to have them within arms reach NO ONE can create any paper crafts without adhesives. Check for any that might need refills soon. Add them to your shopping list. Clean up all tips and ones that have adhered themselves to something. Make sure they are all in ready to use condition. Trash - all glue that is drying up or tapes that are no longer sticky even adhesives that you just simply don't like. You will just end up throwing it away later once it is dried up... so why store it until then? Liquid glue - can have bubbles in it when you are trying to apply it to your work. To keep this from happening so much try storing it upside down... JUST MAKE SURE IT IS FULLY CLOSED so it does not leak... YIKES!!! 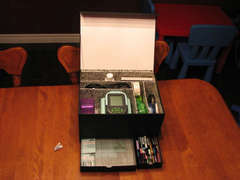 So lets clean up and organize these items, find a "within arms reach" spot for them and purge those unused or unusable. 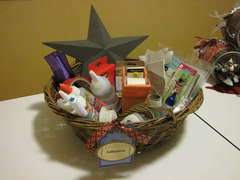 PS... here is my adhesive basket this year: I have an Helmar Habit I think! LOL!